Hot tubs may require service either during the warranty period or after the warranty expires. Owners like toys and accessories to elevate the spa experience. 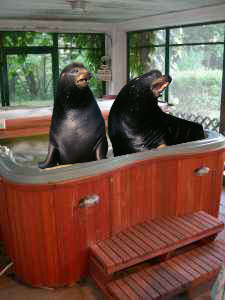 Mad Like A Sea Lion In A Hot Tub? Hot tub problems may involve: water care and filtration, spa pump problems, spa pack and electronic issues, topside control problems, cover replacement or other hot tub component troubleshooting. Maintaining the hot tub will also help avoid issues related to poor water chemistry. Depending on the skill level of the hot tub owner, there are two types of services. One that can be done by the hot tub owner and the other that requires a hot tub service professional to repair the spa. While one hot tub owner may only feel comfortable replacing a spa pillow or chemical floater, another may take on a pump replacement. The tips provided on this site are for information purposes as understanding basic hot tub troubleshooting can also help lower the repair bill. Understanding how problems are created may help avoid them. One reason for hot tub leaks is improper water chemistry which can erode pump seals and other plumbing parts. Another reason for a leak may be improper winterization of the hot tub. Learning about how to maintain a spa and how to properly winterize it in the case of non-use during cold winter months will help avoid costly repair bills. Get more enjoyment from your hot tub with a hot tub cover lifter, weatherproof steps, spa fragrances, LED lighting and other spa accessories. Hot tub toys can also include patio accessories such as outdoor furniture, table and chairs, a bar, a handi spa pad for placing the spa on, or diving sticks, waterproof playing cards or the classic rubber duck. Sometimes, when things go bump in the night, the hot tub may act up. It could be a pump, heater, circulation, filtration, electronics, controls or other issue. Troubleshooting a hot tub problem involves a “divide and conquer” approach. When the problem component is isolated, it can quickly be replaced with easy to buy replacement spa parts online. Maintaining a hot tub involves keeping the water clean and free of harmful bacteria. Spa chemicals are used to keep water clear for 3 months or more between having to change out the water. A sanitizer such as bromine or chlorine takes care of the bacteria, sometimes with help from an ozonator. Test strips or a water test kit are used to monitor the level of sanitizer in the water. PH is balanced between 7.2-7.6 using pH plus or pH minus as needed. The water is shocked every week or two to reinvigorate and reactivate the chlorine (or bromine) sanitizer in the water. These supplies as well as spare filters (change the filter annually!) are available online. Take care of your spa and your spa will take care of you! Get online hot tub supplies from Hot Tub Outpost.